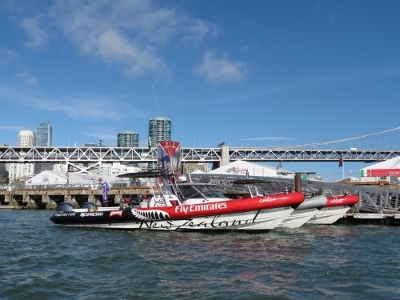 A decade ago, as we watched the America’s Cup races in New Zealand on TV, we longed to watch a race in person from the water. Last week, we got our chance. 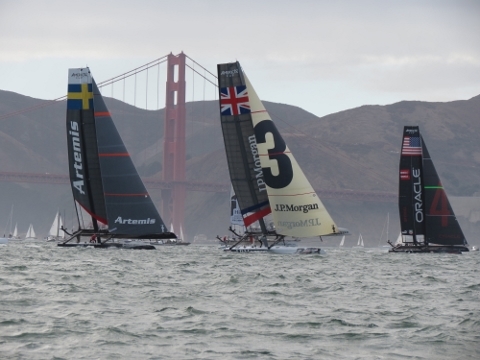 The current America’s Cup defender is the Golden Gate Yacht Club on San Francisco Bay. The races scheduled for October 2-7th have been on our calendar since we realized our trip to the area would coincide. We wanted to get Dirona within dinghy distance of the course, so we anchored for the night outside the South Harbor marina breakwater off AT&T park, about three miles from the course. We were weren’t sure how rough our anchorage might get due to boat wakes and the afternoon winds, but it turned to be fine. And our view, stretching from downtown San Francisco and across the Bay bridge was amazing. 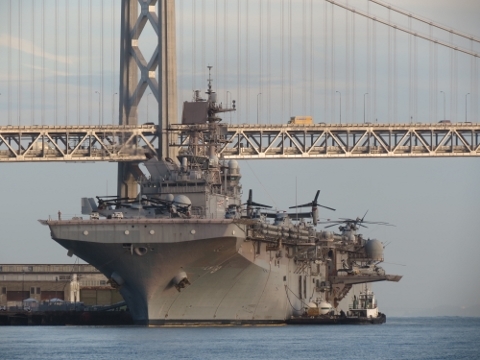 And we could see the America’s Cup fleet moored nearby: in the panoramic photo below, their 70-foot masts are visible at the west end of the Bay bridge just left of the carrier USS Makin Island. Before heading out to the course, we stopped off in “the pits” to check out the boats. Crews already were on board most of them, either preparing the boat or themselves for the afternoon’s event. 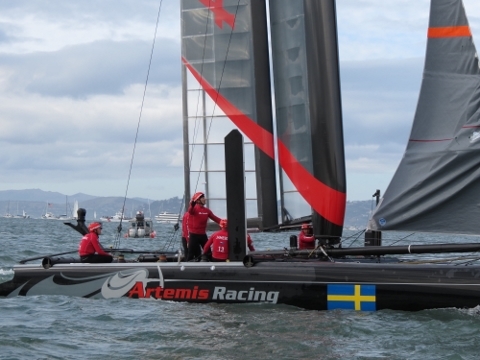 The carbon-fiber AC45 catamarans are like Formula I race cars–just amazing technology. At 44′ long, with a 900 sq. 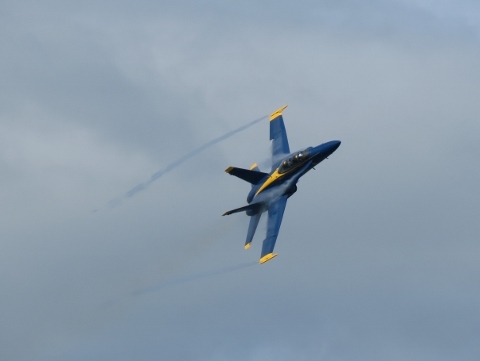 foot wing on a 70′ mast, they weigh only 3,000 pounds and can reach speeds of over 30 knots. Their support boats are pretty nice too. 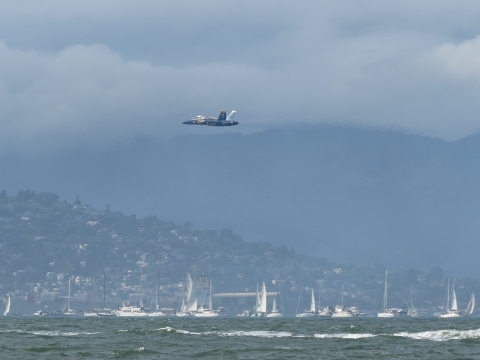 Before the races, we got to see our second Blue Angels show of the year, part of the Fleet Week festivities. 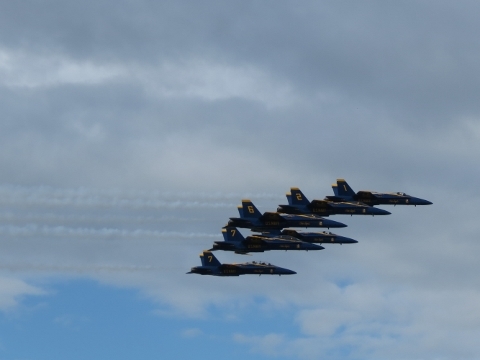 We were a little closer to the action this time and had an awesome view. The shoreline and bay were full of people out to see the show as well. And then for the main event. 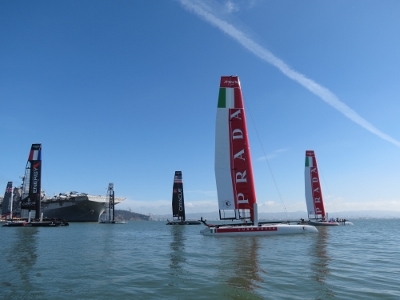 The racing was exciting–boy those boats move fast–and it was just wild to be there watching on San Francisco Bay with the Golden Gate Bridge in the background. There even was some excitement off the course as well. The boat on the right, maneuvering through the spectators, nearly ran us over in the dinghy before colliding with the sailboat on the left. After the races, some of the teams towed their boats back to their moorage, but a few sailed back. The boats ran incredibly well in the rough water–just skimming across the surface. We barely could keep up in our 30-knot dinghy, often having to slow down through larger wakes. 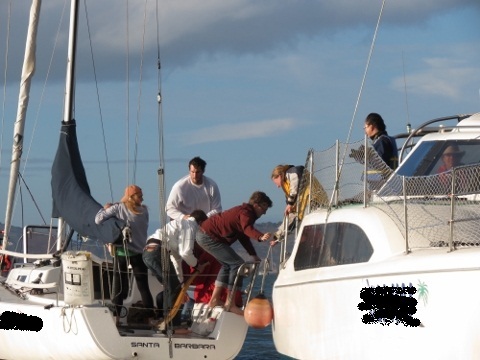 And with some impressive tight-quarters boat-handling, team Artemis even sailed right onto their buoy. 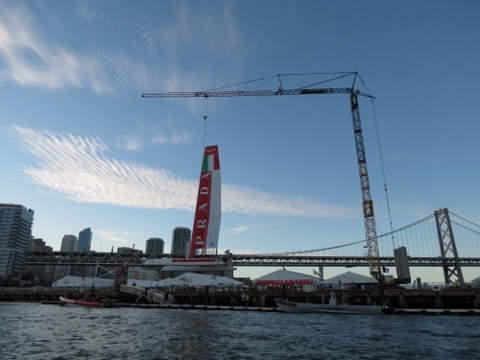 Shortly after we arrived, the Prada boat was lifted out of the water by crane. We could see a large dent in the side, but weren’t sure if that was the reason for lifting it. 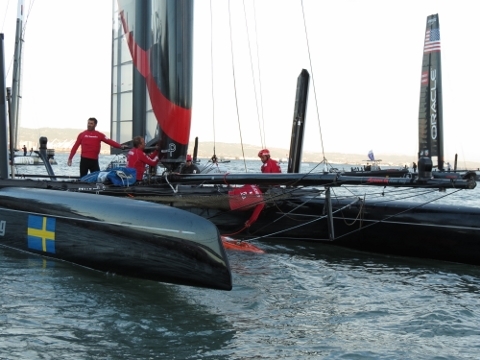 The AC45s will race in several venues around the world as part of the Americas Cup World Series. These boats are designed for quick assembly and disassembly to fit in a 40-foot shipping container. 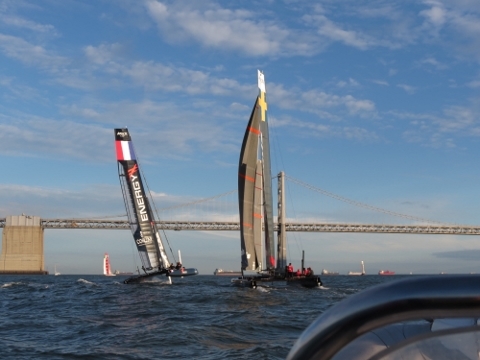 The final races, for the Louis Vuitton Cup and the America’s Cup, will be raced in the massive AC72s. 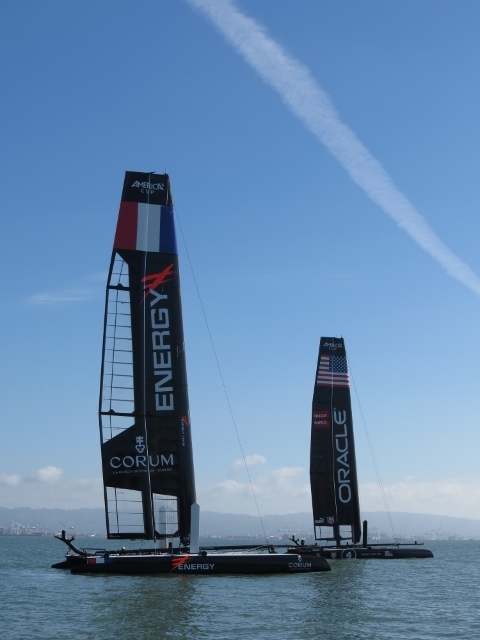 The AC72s are roughly twice the size of the AC45s: 72′ long, with a 131′ mast and a 2,800 sq.-foot wing area, and weighing 13,000 lbs. 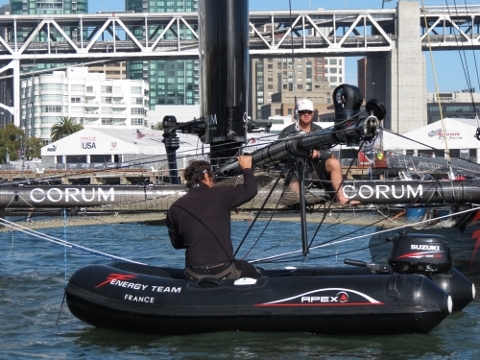 Their crew size is 11, compared to 5 on the AC45s. 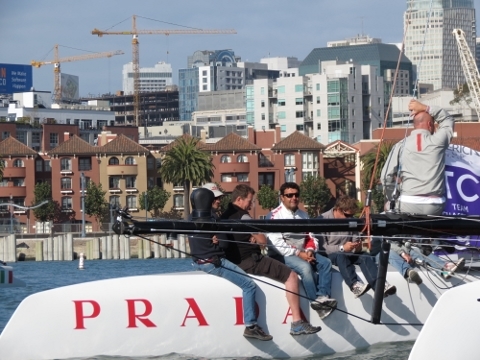 We’d seen defending champion team Oracle’s AC72 out for its world open-water debut a couple of weeks ago. We clocked them on radar at 31.5 knots, and it will be capable of doing considerably more. 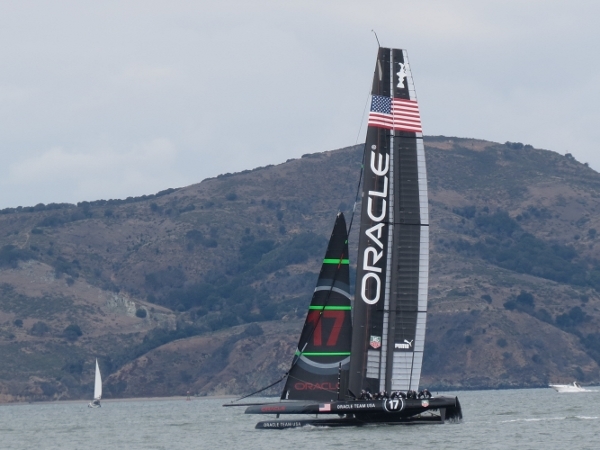 We saw team Oracle’s AC72 again this past weekend. The huge mast dwarfed the eleven crew below it as the boat sped across the bay. 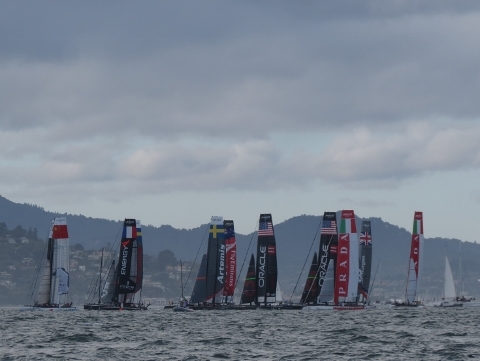 There are an large number of spectator boats jockeying for position so it would be more difficult in the big boat. 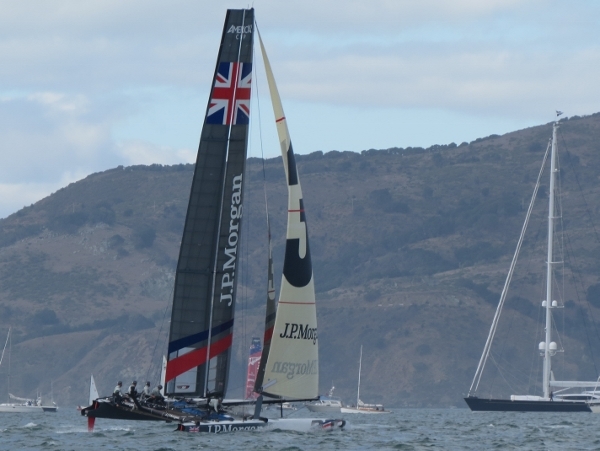 There was likely more contact between boats in the crowd than there was on the race course. 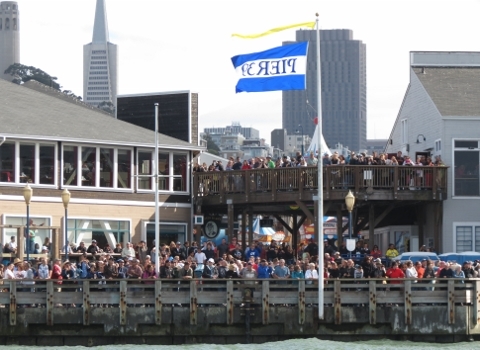 The trick with the dinghy is to get right near the spectator line so boats don’t squeeze in and block your view. Because there is a fair amount of current in the bay, the boats are always moving. If you had the big boat, you could view from further away over the others so it might also work. Given how close the boats were all running, we preferred to be in dinghy. Moorage will definitely be a problem. I would get that organized as soon as possible. Congratulations on your 63 being close to launch. All the best for your voyage to Hawaii! 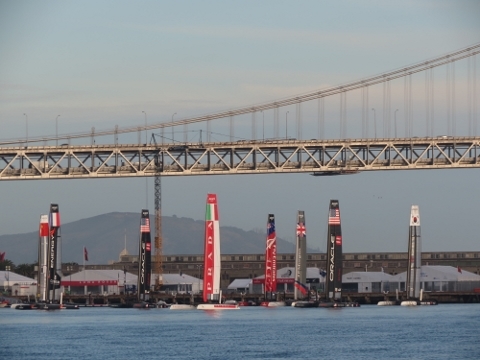 I am considering going to the America’s Cup next fall in SF. What advice can you provide given your recent experience – best ways to watch the races? is it best to use the big boat or a dinghy? do you think getting moorage will be a problem? any other advice?